Please note: Not all possible caster configurations may be modeled. If the catalog option you are looking for is not modeled, please contact us for engineering assistance. Performa wheels offer the advantages of both hard and soft tread materials in a single wheel. Like a hard tread wheel, Performa rolls easily and is very durable. Like a soft tread wheel, it rolls quietly, protects floors and resists impacts with a cushion ride. It also features maximum weather-ability, low temperature flexibility, resistance to chemicals, water and steam, and rejects floor debris such as metal shavings. 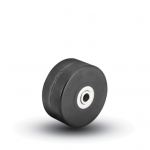 Non-marking thermoplastic elastomer tread is permanently bonded to a ribbed polyolefin wheel core. 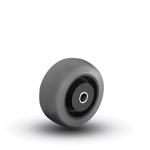 Performa Conductive wheels combine a soft cushion ride with a non-marking tread design. 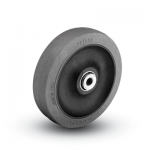 All wheels feature a cushion grey Performa tread bonded to a black Polyolefin wheel core. 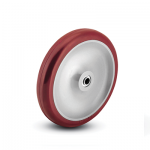 Performa Conductive wheels have been rigorously tested and approved by an independent lab and meet the requirements of federal specification FF-C-88C. This specification requires an average electrical resistance of less than 250,000 ohms. 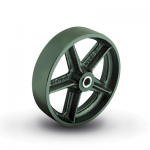 Designed for hard impacts and heavy loads, this wheel is injection molded from an exclusive Colson polyolefin compound. The unique ribbed design adds strength. 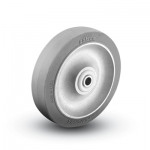 Very light in weight, yet the impact strength of this wheel is far superior to hard rubber wheels. It offers superior resistance to most oils, chemicals, grease, gasoline, cooking fats and acids. In addition, the wheel is stain resistant, non-marking and provides zero water absorption. 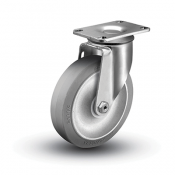 Thermo wheels feature a standard operating temperature range from -70°F (continuous service) to +525°F (intermittent service, +480°F continuous service). 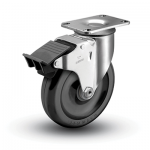 These wheels are molded from an exclusive engineered resin compound that offers non-marking floor protection, near zero water absorption, high load capacities and long service life. A special manufacturing process enables the wheels to retain a consistent bearing bore even when exposed to elevated temperatures. Furthermore, Thermo wheels are 100% recyclable, and they are highly resistant to animal fats, vegetable oils and salt solutions. The life expectancy of Thermo wheels is three times longer than high-temp phenolic wheels, and they offer an equal load capacity. 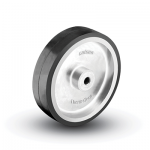 Unlike high-temp phenolic wheels, Colson Thermo wheels have no outer skin that can break and absorb water or other fluids. Colson ThermoTech Wheels feature a rubber tread that can take the heat. They are quiet and non-marking for superior floor protection. The rubber tread is an advanced technology rubber compound bonded to an aluminum core. Polyurethane tread is bonded to a polyolefin core. Tread is molded in, around and through a ribbed extension of the core to prevent debonding. Standard colors are maroon tread on grey core. This is a very attractive, all purpose wheel. Resistant to most chemicals, solvents, water and acids. 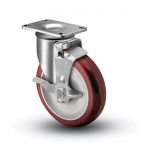 This wheel should be specified when excessive load weights are involved and floor protection is not a factor. Its high strength withstands sharp impacts. Cast Iron wheels should not be used if noise is of major concern or if loads are fragile. 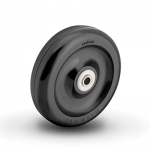 Rubber HI-TECH wheels are made of a thermoplastic cushion rubber tread bonded to a rugged polyolefin core, with capacities to 150 pounds each. 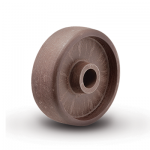 Phenolic resin wheels are filled with macerated fabric. 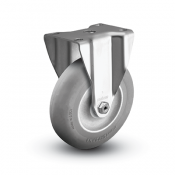 This wheel provides quieter operation than steel or aluminum, provides superior floor protection, and resists hard impacts, most chemicals and steam. The standard color is black. Thread Guards are available on many models, in metal or plastic versions. Top Lock – Colson Top Lock brakes provide positive braking action on all types of wheels. A special cam activated brake mechanism locks firmly and is easy to engage and disengage. Available on all swivel models with solid axle only. Total Lock – Colson’s Total Lock brake locks the wheel and swivel simultaneously. The brake design features durable metal construction with a thermoplastic pedal and provides virtually maintenance-free operation. The brake is easily operated with foot action. Fits 3-1/2″, 3″ and 5″ swivel models. Directional Lock – Lock the swivel for straight tracking on top plate swivel casters. 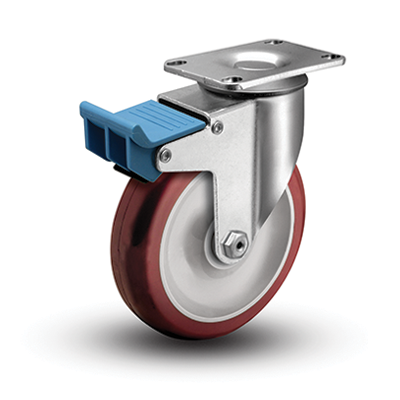 The foot-activated directional lock engages simply and securely into lead or trailing position and is compatible with a full range of wheels.